Palestinian men and children warm up in front of a fire on 30 December at the Khan Younis camp in the Gaza Strip. Crippling power cuts have reduced Gazans to having electricity only three or four hours a day, which prompted a massive protest yesterday. The canal running through Izbet Chokor, called Al Bahr by locals, acts as a lifeline to the village. 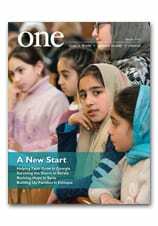 In the current edition of ONE, journalist Don Duncan writes about the ways Christians and Muslims are Finding Common Ground in one Egyptian village. He offers some addition reflections on his visit below. I was living in Lebanon when the series of national revolutions known as the “Arab Spring” broke out. At the time, I was covering the region as a freelance journalist. While I had been to Tunisia shortly after that inaugural revolution of the Arab Spring had kicked off, once the news started to hit that Egypt was following suit, everyone knew that this was big, big news. Many in the region view Egypt as the “beating heart” of the Middle East. It is a large country — in terms of population and of historical significance — and it acts as a sort of fulcrum between various parts of the Arab world: between the Levantine countries; the Arabian Gulf area and Iraq on one side and the Maghreb and the other Arabic-speaking African states on the other, such as Chad, Djibouti, Eritrea, Mauritania, Somalia and Sudan. Sitting in my living room in Beirut, with my flat mate Dia, we watched agog, as pictures of thousands of people streaming onto Tahrir Square in Cairo flickered across our TV screen. Within a few days, I myself was in Egypt covering the events as they unfolded. But it wasn’t until months later, when the dust started to settle, that the new dynamic and primary currents in post-revolution Egypt began to come into focus. In early 2012, a year after the beginning of the Egyptian revolution stated, I returned to Cairo to make a video documentary for the website of The Wall Street Journal about these new currents in Egypt. Among the various changes apparent in post-revolution Egypt, some of the big changes we covered in this documentary included the sudden rise and expanding power of the previously repressed Muslim Brotherhood organization. In parallel, another current was the growth in persecution against Egypt’s Christians, who represent some 9 percent of the country’s population of 80 million. The vast majority of that number is Coptic Orthodox, but it also includes minorities within the Egyptian Christian arena: Coptic Catholics, as well as various Protestant churches. Across the broader Middle East region — since the 2003 U.S.-led invasion of Iraq and the other Arab Spring revolutions post-2011 — the same narrative has played out: dictatorial regimes have fallen, giving rise to the emergence of hitherto repressed Islamist movements, leading to increased persecution of Christians. Apart from the Egyptian example, this has occurred most notably in Iraq and Syria. However, on arriving at Izbet Chokor, I found a completely different picture to the one that had been so often presented by the media. Izbet Chokor, the village on the outskirts of Al Fayoum city, some 60 miles southwest of Cairo, is the place I traveled to in order to report my most recent story for ONE magazine. There, I found a village with a mixed population of Christians and Muslims who live in peaceful co-existence and love. This was due, in large part, to the Service Center, run by the Coptic Catholic church there, which offers educational, healthcare and social services to all the residents, regardless of religion. It was a big surprise to me to learn that the major center of religious tension in Izbet Chokor was not between Christians and Muslims but rather one that was intra-Christian in nature — between Coptic Orthodox and Coptic Catholic. According to many people I spoke with, some of them members of the church, the rivalry and tensions between the majority Coptic Orthodox and minority Coptic Catholics in Egypt are fierce, mostly manifesting itself in the form of verbal attacks, intimidation, and bullying. Regardless of the reason(s), this discovery showed me that inter-religious fear and animosity can exist anywhere where ignorance is allowed to breed. It is not about some clash of civilizations or age-old incompatibilities, as the media subtext regarding Muslims and Christians seems to suggest. It is about ignorance and manipulation by politicians or the media, often both. So, in this time of heightened tensions, misunderstanding and suspicion between the West and the Muslim world, I feel it is incumbent on us as Christians and human beings to do our utmost to re-inject humanity and nuance into the divisive, fear-inducing and dehumanizing media discourse we are subjected to by our politicians and media. Read more in the Winter 2016 edition of ONE. Meantime, get another glimpse of the Service Center in the video below. In this image from December, Syrian pro-government forces walk in the ancient Umayyad mosque in the old city of Aleppo. There are growing concerns that ancient antiquities such as this are in serious danger of being lost forever in the wake of the country’s civil war. A priest in Ethiopia prepares a censer with the help of young parishioners. Ethiopia is finding new ways to spread the Gospel, using both religious and lay catechists to inspire young people. Read about this and more in Ethiopia’s Sleeping Giant in the Winter 2016 edition of ONE. In this image from 8 January, a member of Free Syrian Army plays with a dog as the FSA members advance to al-Bab district of Aleppo during the ‘Operation Euphrates Shield’ in Syria. In Egypt, children with special needs have many disadvantages. Yet at Santa Lucia, the nurturing environment and commitment to higher learning provides some balance. Named for the fourth-century saint and patron of the blind, St. Lucy — who, according to tradition, was blinded before her martyrdom — the home encourages children to rise above their limitations. They are taught that nothing is beyond their reach, and the children are expected to shine. “We teach them independence,” says Sister Souad Nohra, the director of the home. At the home, children who once might have spent their lives in the shadows — helpless or hopeless — are receiving an incalculable gift. Darkness is giving way to light. The center cares for 5 girls and 11 boys between the ages of 4 and 18. Most students come from poor farming villages in Upper Egypt or the outskirts of Alexandria. The sisters provide for every need — from clothes and books to food and extracurricular activities, such as sports and music. They also organize field trips to the beach. Upstairs in the center’s immaculately clean dormitory, the children have their own numbered cupboards. The children are expected to dress themselves. At meal times, students procure their own cups and silverware from dining room drawers, and then clean up after themselves. “They have to know they can do these things by themselves. They are very proud; they don’t have to depend on anyone,” says Sister Souad. Sister Souad says they begin preparing children for the task from day one. One of their students recently received a scholarship to study in the United States. “I hope other blind children learn that going away from their family is not that difficult; it can be much better for their future,” Abanoub says. Sister Souad and the other sisters at the home are heroically making the impossible possible — giving hope to those who so often feel like outcasts, helping to bring light to those born in darkness. The Apostleship of Prayer has released an inspiring new video to accompany Pope Francis’s prayer intention for the month of January. Pope Francis’ prayer intention for January is for Christians serving the challenges facing humanity, in which he asks that full ecclesial communion be restored in order to serve the challenges facing humanity. A displaced Iraqi girl who fled the violence in the ISIS stronghold of Mosul holds a balloon at the Khazer refugee camp for displaced people near Erbil, the capital of the autonomous Kurdish region of northern Iraq. Iraqi forces have renewed their effort to seize Mosul.